UFO SIGHTINGS DAILY: Amtrak Investigators Say Flying Object Hit Train, Causing Bright Flash Before Hit, May 2015, UFO Sighting News. Amtrak Investigators Say Flying Object Hit Train, Causing Bright Flash Before Hit, May 2015, UFO Sighting News. 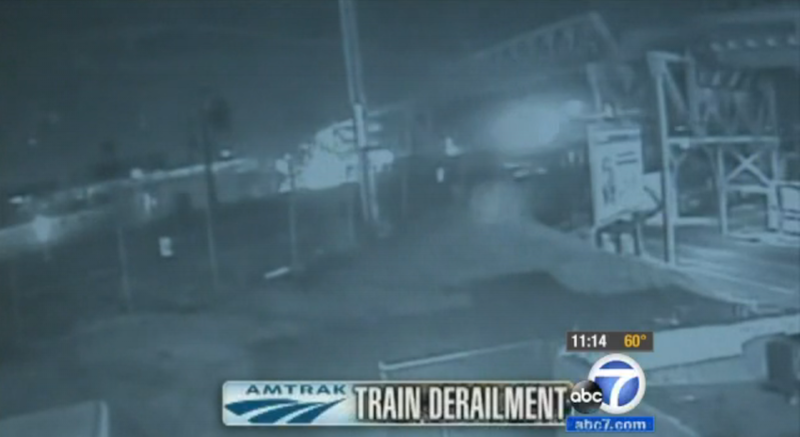 The train is seen in the video having a blinding light coming from its front moments before it derailed. There was a massive flash of light in the video (won't allow me to embed it). The flash of light happened before the train crashed and investigators are saying the train was hit by a flying object. Was this object that hit the train an alien ship or drone. The flash before the crash seen on video would indicate that it is highly possible. Flashes of white light are often associated UFOs from eyewitness reports, videos and photos. Rocks, birds don't usually cause giant bright flashes of light. So I am looking forward to seeing what the driver says in the next few days. For instance, let me show you a video below of a glowing UFO following a train in Russia in 2014. Let me shed some light on this incident with a UFO report that happened in Jan 14, 2002 with a train hitting a UFO. At exactly 2:47 AM, on January 14, 2002, while working a coal train in route from Russell, Kentucky to Shelbiana, Kentucky, our trailing unit and first two cars were severely damaged as we struck an unknown floating or hovering object. I know it was 2:47 because my watch froze, and to this day shows that time. Along with my watch the entire electrical systems on both locomotives went haywire.Approaching a bend near milepost 42 in an area referred to as the Wild Kingdom, for the many different types of animals spotted there, my conductor and I saw lights coming from around the way. This ordinarily means another train is coming and will pass on the other track. The outlay of the area is this, the river, #1 track, #2 tracks and a straight up mountainside, carved out for the laying of these tracks. I killed our lights as not to blind the oncoming crew. As we rounded the corner our onboard computer began to flash in and out, speed recorder went nuts, and both locomotives died. Alarm bells began to ring and that’s when we saw the objects. Apparently scanning the river for something. At least three objects had several "search" lights trained there, the first object hovered about 10' to 12' above the track. It was metallic silver, and had multi-colored lights. It was 18' to 20'in length and probably 10' high. There were no windows or openings of any kind that we could see. With both engines dead as we rounded the corner we made little noise and the first object did not respond in time, I estimate that we hit the object at 30 MPH, with 16,000 trailing tons behind us. It clipped the top of our lead unit then skipped back slicing a chunk out of our trailing unit and first two coal cars. The other objects vanished. Our emergency brakes had initiated due to the loss of power and we stopped approximately a mile and a half to two miles after impact. Our power restored after we were stopped and we notified our dispatcher, located in Jacksonville, Florida, of what had happened. We were told to inspect the cars to see if they'd hold the rail and try to limp into milepost CMG-60 which used to be the Paintsville yard which is no longer in full operation. We checked everything out and the cab of the rear locomotive was demolished and smoking, the second two cars looked as if they had been hit with a giant hammer, but looked like they'd hold the rail. We pulled into Paintsville yard at approximately 5:15 AM. The huge overhead lights lining the yard were noticeably dark and the only lights came from what we assumed were railroad official vehicles parked near the end of the track. We pulled to a stop and began unloading our grips off the wounded train. We could hear what sounded like an army of workers immediately tending to our train. Vehicle doors slamming, guys running by in weird outfits and lights glaring from all directions, the one thing missing was railroad officials. A guy named Ferguson shook my hand and asked me to follow him into the old yard office. We did, and once inside they, and by they I mean I have no idea who these people were, began to ask us hundreds of questions, they then told us for our own protection we'd be medically tested before we could leave. I asked repeatedly to talk to my road foreman or train master and not only were these requests denied but they confiscated my conductor’s cellular phone. Hours later we were led outside the old yard office and the strange things continued to happen. The two locomotives and two cars were removed from the rest of the train we had brought in and my only guess was parked 4 tracks over under a huge tent like structure buzzing with activity. We were led off the property and told, due to national security, our silence on this matter would be appreciated. We were then put in a railroad vehicle and taken to Martin, Kentucky, where we went through questioning again with railroad officials and were then drug tested. After the crew was tested for drugs, they rested for eight hours, and then were sent to work another train. They would again pass Paintsville, but strangely, there was no sign of the locomotives, the two cars, the tent that contained the cars, or any of the investigators. The entire scene of the investigation had been removed.